A new wine for the new century: BriO de Cantenac Brown was born in 2001. Through the style of its label, but also through the quality of our work from the selection of the lots to the bottling, it aims at expressing the modernity of our Château. The lots supposed to be the main part of BriO are pre-selected because of their evolution all through the year, which means that we focus on each different lot of the winery, from the budburst through the flowering to the ripeness control. The lots for BriO often need more work: more leaf pruning, some green harvest, for example on the young vines, to help them to deal with the weather conditions. Our two labels are made from vines located on a beautiful terroir where you find gravelly soils, and we want the vinification of BriO to lead to an elegant wine with lots of flavours, a compromise between strength and finesse. So, if you like the fruits, you can start to drink it from 2 to 5 years after the harvest. The blend between Cabernet Sauvignon, Cabernet Franc and Merlot is different for each vintage but the Merlot percentage is usually more important than the one in the Château Cantenac Brown. The 12 months-long ageing in 20% to 25% new oak barrels is traditional; we rack it every 3 months. Before the bottling, we do the fining with egg whites. 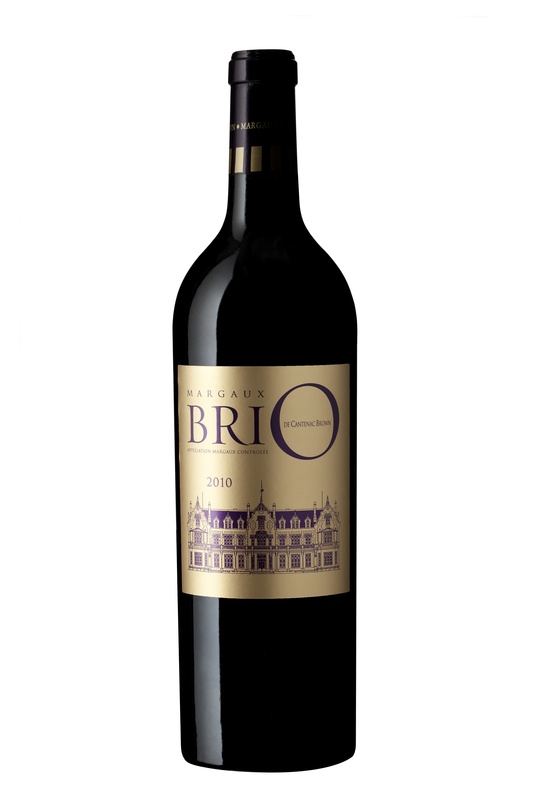 It is on purpose if the bottles of BriO are different from the ones of Cantenac Brown: we want BriO to become a brand on its own, and it’s true that we talk much more about “BriO” than about “BriO de Cantenac Brown”. We want BriO to be a wine you drink before, during and after a meal; just for your pleasure. At the beginning of the 19th century, John-Lewis Brown (1769-1851), bought a vineyard and designed in the village of Cantenac, a traditional Tudor style château, reminding him of his Scottish origins. His name is forever linked to the Grand Cru Classé. His grandson, John-Lewis Brown (1829-1890) esteemed animal painter and “Chevalier de la Légion d’Honneur”, spent time there during his childhood. In 1843, Mr. Gromard, banker, took over the estate. After the 1855 Grand Cru Classification, Louis Armand Lalande (1820-1894), Bordeaux winemerchant and owner of several estates in Médoc, extended the building. Surrounded by a remarkable British style park, Château Cantenac Brown is since then among the most original in Médoc. In 2006, the Simon Halabi family has given new impetus to the estate with the ambition of raising it to the highest echelons. José Sanfins presently manages Château Cantenac-Brown. He does his utmost to make the best of the magnificent terroir, lavishing the greatest of care on the soil and the vines, with great respect for the environment. This meticulous attention to detail continues into the cellar, where everything possible is done to produce an exceptional wine. John-Lewis Brown (1769-1851) acquired the estate in the early 19th century and decided to build in the village of Cantenac, a Tudor style chateau reminiscent of his Scottish origins. The building is one of the most unusual in Médoc region and is surrounded by a remarkable English-style ground. The quality of the wine was acknowledged in the 1855 classification, when Château Cantenac Brown was included into the growths. The Bordeaux winemerchant and owner of several estates in Médoc, Louis Armande Lalande (1820-1894), extended the building, keeping the same architecture. …which they are determined to raise to the very highest level. José Sanfins presently manages Château Cantenac-Brown. He does his utmost to make the best of the magnificent terroir, lavishing the greatest of care on the soil and the vines, with great respect for the environment. This meticulous attention to detail continues into the cellar, where everything possible is done to produce an exceptional wine. With José Sanfins in charge, methods have changed. The vineyard is managed in a more environmentally friendly way: the “sustainable approach” goes without saying. The vines are cared for throughout the year and yields are perfectly controlled. Strictly plant-based fertilizers are applied in a moderately and balanced way in tune with the needs of the vines. This respect for Nature explains why the Château Cantenac Brown team continues to use the traditional soil maintenance techniques, which gradually enhance the structural, chemical and biological properties of the earth. Over 400 000 vinestocks are managed every year. Pruning, removal of buds, leaves and secondary shoots, hand harvest …, several times per year the whole team works vine by vine and checks each single cluster. Such a sharp selection does not replace the environment. The finest wines are given by the Nature. Classy and complex on both the palate and the nose. Aromas of truffle, black currants and smoked game fill the nose. Spicy black currant and cherry flavors knit wonderfully together with refined yet firm tannins. Finishing off with a persistence you'd expect from much more expensive Napa Cabernet and a touch of silk wraps this full-bodied wine. Aged in French oak barrels for 14-16 months. Viña Siegel Unique Selection is the utmost expression of our best Los Lingues vineyards located in the Alto Colchagua region. A deep violet color. There are aromas of cassis and cherries with hints of spices, chocolate and violets. This wine is characterised by its complexity and harmony, with a robust tannic structure. After carefully selecting the optimum harvest date, the grapes are hand selected, then they are de-stemmed and cold macerated for 5-6 days. Alcoholic fermentation occurs at 26-29°C, during this period pump overs are performed daily at the winemaker’s discretion. Post-fermentative maceration occurs for 2 to 3 weeks. The wine is smoothly clarified. Cold stabilisation only occurs when necessary. Lots of flower petal, dark fruit and hits of bark. Full body, round tannins and a flavorful finish. A complete and delicious red. Better in 2017, but why wait?" "The blend of 45% Cabernet Sauvignon, 35% Carmenere and 20% Syrah is an expressive array of deep, black fruit and spice. A vein of chocolate sweetens violets petals and the texture and density of the wine is impressive to the finish. Aged in French oak for 14-16 months. A true-blue match with red meat. - Meridith May"
"Rustic aromas of baked berry fruits, black olive, herbs and eucalyptus lead to a forward, fairly tannic palate. An herbal flavor profile includes olive, blackberry, plum and spice notes, while the finish on this Cabernet-led blend tastes peppery and herbal, which is nothing unusual for Chile. Drink through 2020." Well structured and round, it displays red fruit, leather, black cherry, liquorice and black berry aromas. Medium yellow green. Fine nuances of ripe apricot, a hint of yellow apple, delicate herbs and spices, mineral Touch, hints of candied orange zest. Juicy, elegant, fine stone fruit, touch of finesse acidity, salty minerality in the finish, remains long, already well to drink.